The 15-foot High Inflatable Time to Party Slide is ideal for a wide range or indoor and outdoor events such as birthday parties, barbecues or school carnivals. This 15-foot High Inflatable Time to Party Slide is sure to be a sensation with both the children and grown-ups alike. This slide is intended to be used dry at this price. 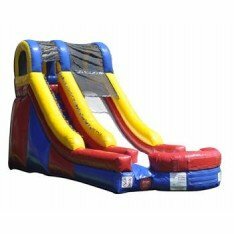 It is designed to also be used as a waterslide with the addition of the small water attachment at checkout or rented through the water slide category. Slide drop and slope vary by slide type. Please contact us for further information.